The Supreme Court has rejected the apology of PTI MNA Aamir Liaquat in a contempt of court case. The court said on Tuesday that Liaquat has failed to accept his mistake and ruled that he will be charged with the crime on September 27. “If proven guilty, Aamir Liaquat will be disqualified,” remarked Chief Justice Mian Saqib Nisar. “People have turned this into a big joke. First, you disrespect [the law] and then apologise,” he observed. The PTI leader’s lawyer said his client’s comments have been taken out of context. The case against Liaquat has been filed by the Independent Media group — the parent company of the Jang and Geo groups — Mir Shakilur Rehman, Najam Sethi and Shahzeb Khanzada in May 2017. 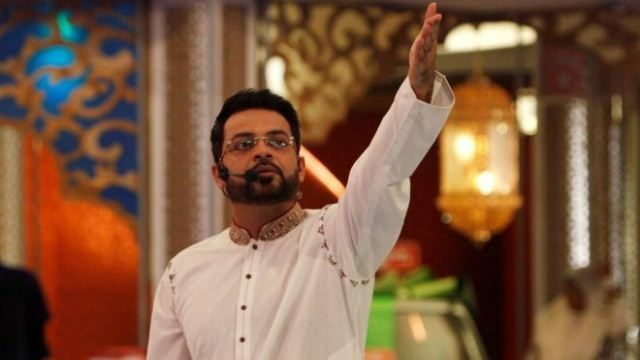 The petitioners said that Liaquat violated his March 28, 2017 restraining order in which he was told to refrain from defaming others and hosting television shows in an unethical manner. The next hearing will be held on September 27.